Mtata was speaking to local ecumenical fellowship leaders, including United Methodists, drawn from the 10 provinces of the country who attended a two-day workshop at Kentucky Hotel in Harare. Zimbabwe was engulfed in a three-day shutdown called upon by the labor unions as a response to fuel price hikes. Clashes between protesters and Zimbabwe security forces left 12 people dead and hundreds injured. Mtata, in his opening address, called on the churches to “see, judge and act” around the events that have torn apart the nation. 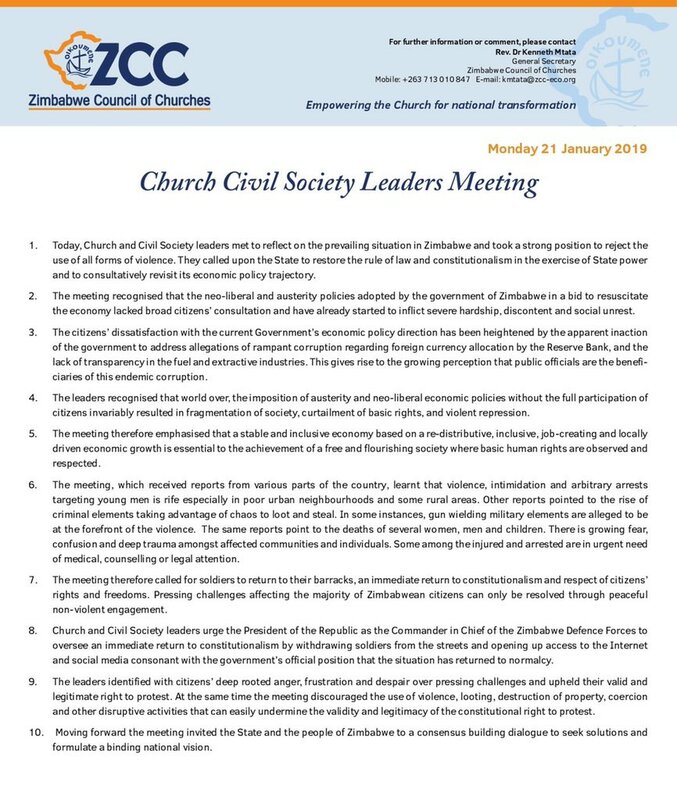 Church leaders at the meeting issued a 10-point statement rejecting all forms of violence. They called on the state to restore the rule of law and constitutionalism and to revisit the country’s economic policy trajectory. The statement also urged respect of citizens’ rights and freedoms, while discouraging the use of violence, looting and destruction of property. “My heart is still shaken at the sight of violence that rocked my area. ... My mother, sister and 4-year-old nephew were beaten when soldiers broke into our house,” said Patience Sakabuya, 27, pastor of United Congregational Church of Zimbabwe in Mabvuku, Harare. “I saw the masked military personnel going into Mabvuku Primary School on the first day of the protests. Young kids screamed at the sight of the soldiers as they roamed their school,” she added. The aftermath of the protests saw law enforcement picking up alleged perpetrators, and hundreds of citizens facing court prosecution. In order to deal with the present and the probability of future arrests or alleged abductions, Fadzai Traquino, a practicing lawyer with Women and Law in Southern Africa, noted the need for the church to be aware of legal provisions during protests for assisting members facing arrests. “The utter disregard of human life has been passed on to the young generation. ... Now in Zimbabwe, violence knows no age,” Mtata said. He said there are very dangerous indicators that are driving into an era where Zimbabwe could easily degenerate into a failed state, including a disregard for human life, discord within the armed forces and disrespect for people with different views. As a way of responding to the “degenerate and fragmented” state of affairs, Mtata said engagement is the only alternative and way forward for Zimbabwe. President Emerson Mnangagwa has extended an invitation to dialogue with the opposition political parties, civic society organizations and churches. Pastors at the workshop were both skeptical and optimistic of the success of such dialogue. “The genuineness of this invitation has been received by some with suspicion, but as the church, we continue to insist that the only way out of the chaos in Zimbabwe is for the nation to engage,” Mtata said. “In our communities such as the Chiredzi, we have seen leadership of the ruling party and opposition working together for the common good, but it appears this gets complicated at the national level,” said the Rev. Francis Mariki of The United Methodist Church. The Zimbabwe Council of Churches has been involved in positive engagement and advocacy with the state from the 2018 pre- and post-election period through the #iprayivote campaign. Maforo is communicator for the Zimbabwe Episcopal Area.